Fish Tales Charters is proudly owned and operated by Cairns locals Darryl and Raewyn. Darryl has enjoyed fishing all his life, spending every possible moment not only fishing and exploring the local Cairns area from Hinchinbrook Island to Weipa on the Cape York Peninsula including reef, rivers and creeks in-between; many a holiday was & always will be spent with his wife Raewyn, the dog and a boat in tow. It is local knowledge and wealth of fishing experience in Cairns & the Cairns Region that makes a Guided Estuary and/or River Fishing adventure with Darryl and Raewyn at Fish Tales Charters one of the best fishing experiences that you will ever have. Fish Tales Charters are open to instructing and educating on everything from how to catch ourtropical saltwater fish species, to the correct handling and care for the fish species, as well as cooking and dining for all our customers. Fish Tales cater for different levels of fishing experience, from the beginner, to the passionate, from the young to the elderly. 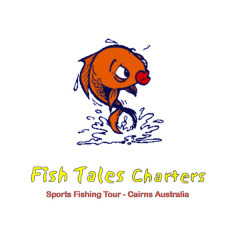 Fish Tales cater for families or a group of mates out for a day of fishing and exploring.